Rogue One was always a bit of a gamble. While still taking place in the same universe as the rest of the Star Wars movies it was never meant to be a part of the main story, although there is plenty of intersection. WARNING MINOR SPOILERS AHEAD. Directed by Gareth Edwards, of Monsters and Godzilla fame, the movie makes it clear that it wants to stand on its own within the first few frames. This is the first film in canon to completely remove the iconic opening scrawl, instead choosing to send the audience into unknown territories and brand new planets. The direction is very grounded with very little CGI making even the craziest worlds feel so real you could touch them. The story itself is rather complex involving the creator of the Death Star and his daughter who has grown up on the wrong side of the Empire. Jyn Erso (Felicity Jones) has been a troublemaker almost all of her life growing up with one of the Rebellion’s greatest militant leaders (Forest Whitaker). While she might technically be labeled a Rebel she has never stayed in one place long enough to align herself with the military side of the fight. All the changes when she is recruited by the Rebellion to find her father and learn about the super weapon he has helped to create. Along the way we meet a Jedi-like monk (Donnie Yen), his battle hungry friend (Wen Jiang), an enemy defector (Riz Ahmed) and a battle weary Rebel leader (Diego Luna). The ragtag crew is also helped by reprogrammed war droid K-2SO voiced by the always amazing Alan Tudyk. The result feels more like The Wild Bunch than Return of the Jedi and, to be honest, it absolutely works. 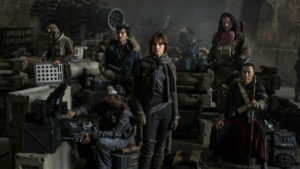 The Rebels come together to fight in Rogue One. Edwards pulls no punches and isn’t afraid to unleash the Dark Side of both the Empire and the Rebellion. If the numbered series of Star Wars movies deal with strict boundaries between good and evil Rogue One exists somewhere in the middle. That wild card factor adds to the spark that makes Rogue One such a special film. In A New Hope everyone knew right away that Obi Wan Kenobi was the good guy, there was never any question of that, but all of the characters in Rogue One walk such a fine line it is open to interpretation. That elevates all of the characters and adds a spark of danger to every scene. Rogue One also sports the most diverse cast in the universe. There are people from all walks of life and galaxies inhabiting this movie, and it gives it a sense of realism that most of the other films lacked. One also had the impression that the universe was much wider and more diverse outside of the Skywalker story that was presented in both of the trilogies but that is never more apparent than in Rogue One. It is a universe that feels lived in too. It is as if Edwards went through the prequel trilogy and made note of all of its problems then vowed to never do them again. While Lucas’ universe was shiny and polished this is a dirty, deadly galaxy filled with cultures that most have never even heard of until now. It is a fascinating journey. In the end Rogue One was only a test for LucasFIlm and Disney. Assuming it dominates the box office like it should the movie will be the first in a long line of stand-alone anthology films that explore the universe deeper. That allows for a nearly infinite number of opportunities and stories to tell outside of the main Skywalker battle between good and evil. It is a genius move. So don’t wait, go out and see Rogue One right now. Make sure to watch it on the biggest screen you can to take in the grand scope and beauty of it all. This trip to a galaxy far, far away is worth the price of admission.